" (..) Hieroglyphs on a sarcophagus in the tomb identify Isisnofretas a spst, or noblewoman—an honorific reserved for women ofthe royal family or of otherwise exceptional status.(..) The tomb complex measures 89 by 34 feet (27 by 10 meters)[and] includes the base of a pyramid, a monumental gateway, acolonnaded courtyard, and an antechamber with three cult chapels. (..)Though Isisnofret's chapels are in ruins, partly due to looting,archaeologists have found fragments decorated with hieroglyphs. (..)Inside Isisnofret's tomb building, a limestone sarcophagus was foundholding three skeletons—degraded mummies whose ages and sexeshave yet to be determined, according to the preliminary WasedaUniversity report. 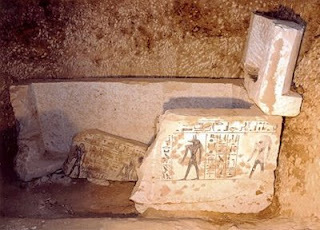 The team is unsure why the sarcophagus holdsthree bodies, or even what the original state was. The sarcophagusis missing its internal, wooden coffin—perhaps stolen during theancient pillaging that seems to have stripped the tomb of funeraryobjects. (..)"After making DNA tests, we will realize who it is … ," said MohamedEl Ashry, an Egyptologist who works with the Waseda University team.Khaemwaset's "mummy is at the Egyptian Museum, and Ramses II'smummy is also at the Egyptian Museum" in Cairo, El Ashry said—making both readily available for DNA testing. (..)"